This is one time when Disney should have stuck to the original story. People familiar with the beloved Tchaikovsky ballet, based on an 1816 tale of “The Nutcracker and the Mouse King” by E.T.A. Hoffman, won’t see much they recognize in this 2018 film. In the ballet, a wealthy European family celebrates Christmas with a party at their mansion, to which other families have been invited. The children’s godfather Drosselmeyer, a toymaker, brings a Nutcracker doll for young Clara, which brother Fritz breaks. It’s that broken Nutcracker, tucked under her arm, that leads Clara to dream of battles between a Mouse King and soldiers led by the Nutcracker, and of exotic delights and doll dances in The Land of the Sweets—all colorfully rendered onstage in a production that’s become a beloved holiday classic. But why in the world would a film company known for injecting music into its films skimp on the music for this one? Though the ballet is magical and Disney has a reputation for creating magic, Tchaikovsy’s music and the magic get lost in the second act, which bogs down in exposition and familiarity. Oh, the magic returns at the end and it’s there for the opening, where viewers get caught up in the excitement and grandeur of a 19th-century ball on Christmas Eve, backed by strains (albeit songs out of order) of Tchaikovsky’s Nutcracker Ballet. But Disney being Disney, they couldn’t keep themselves from killing off Clara’s mother, so the film begins on bit of a downer as their morose father tries to get through his first Christmas without his beloved wife. Disney also felt compelled to make Clara a princess—how else could they market her?—and because the latest trend in princesses is to empower them, Disney decided to make her a science whiz and inventor. That’s when the film strains at the seams and tears off into derivative territory. 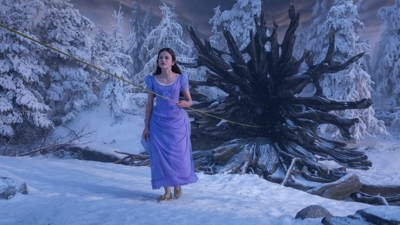 As everyone at the party follows strings attached to their nametag leading to a present, Clara’s string takes her through unfamiliar rooms and down a long dark corridor that leads to a hollow log that’s the portal to a wintery forest world. I mean, it might as well have been a wardrobe she stepped through, it feels so derivative of the Narnia tales. Then, when she’s about to claim her prize—a key that she thinks will open a metal egg her dead mother left her—a mouse scurries off with it. And like Alice chasing a rabbit, she follows the little creature down a hole which leads to “the realms” where two queens are warring: Sugar Plum (Keira Knightley) and Mother Ginger (Helen Mirren). 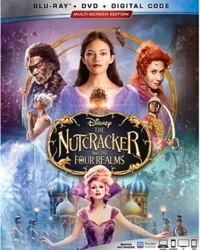 Now might be a good time to mention that The Nutcracker and the Four Realms (we really don’t see any progression through realms, so the title seems contrived to attract video game players) is rated PG for some mild peril. But if your small ones are afraid of clowns, when Mother Ginger shows up, get ready to hug them close. Instead of dancing bon-bons under a life-size Mother Ginger’s dress, it’s a Godzilla-sized mechanical MG with menacing clowns (is there any other kind?) hidden under that enormous hoopskirt. When the real Mother Ginger emerges and we see she’s just human-sized, it’s hard not to have Wizard of Oz flashbacks. And when the mice fight mechanical soldiers, and Sugar Plum uses an invention that Queen Marie (Clara’s mother) made for them, but turning it around so that instead of making toys come to life it reduces humans to toys, it will remind some viewers of that other disappointing Disney Christmas film, Babes in Toyland (1961). What Disney does spectacularly well are their costume, art, and set designs. 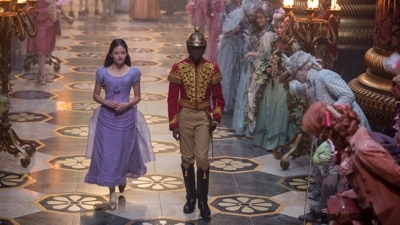 But while Mackenzie Foy makes a warm embrace of a heroine as Clara and Keira Knightley knocks it out of the park as Sugar Plum, Mirren’s performance lacks energy and inspiration, the Nutcracker is just plain bland, and Morgan Freeman’s talents are wasted as Drosselmeyer. Small children may go for this (well, everything but the clowns), but ballet fans will be disappointed—especially since prima ballerina Misty Copeland is also underutilized, a fact the filmmakers seem to acknowledge in an end credits sequence featuring more dance. This was a surefire hit that got away from Disney because they couldn’t bear to stay closer to the Tchaikovsky ballet. But bringing it to life on film would have been innovative enough.